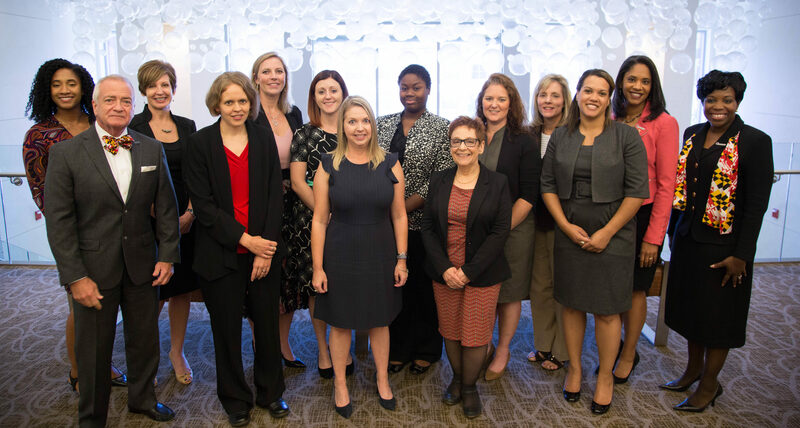 The 2017 “Women to Watch” nominees and dignitaries, from left: Rachel Ellis, MACPA Chair Ken Kelly, Faye Miller, Lisa Blackmore, Christina Bennett, Brittany Sullivan, Kimberly Mustard, Marian Harvin, Debby Hallett, Michelle Chopper, Nancy Buckley, Savedra Scott, Jina Etienne, and AICPA Chair Kimberly Ellison-Taylor. Not pictured are Rivka Bier, Sylvia Lagerquist, and Kathy Raffa. Two outstanding business leaders have been honored by the Maryland Association of CPAs as Maryland’s “Women to Watch” for 2017. Lisa Blackmore, CPA, MBA, a partner with Squire, Lemkin + Company, LLP, has been honored in the “Emerging Leader” category, while Faye Miller, CPA, a partner with RSM US LLP, has been honored in the “Experienced Leader” category. Launched in 2014 by the American Institute of CPAs, the awards highlight the accomplishments and contributions of women in the CPA profession and demonstrate to emerging female leaders that success is not out of reach. “(Women) are leaders in our communities, homes, and in business,” said Kimberly Ellison-Taylor, chair of the AICPA’s Board of Directors, a former chair of the MACPA’s Board of Directors, and an executive director in Oracle’s Global Industry Solutions Group. “As leaders, we work hard every day to improve our credibility, capability, and our commitment to excellence. Our nominees are an indication of that excellence. 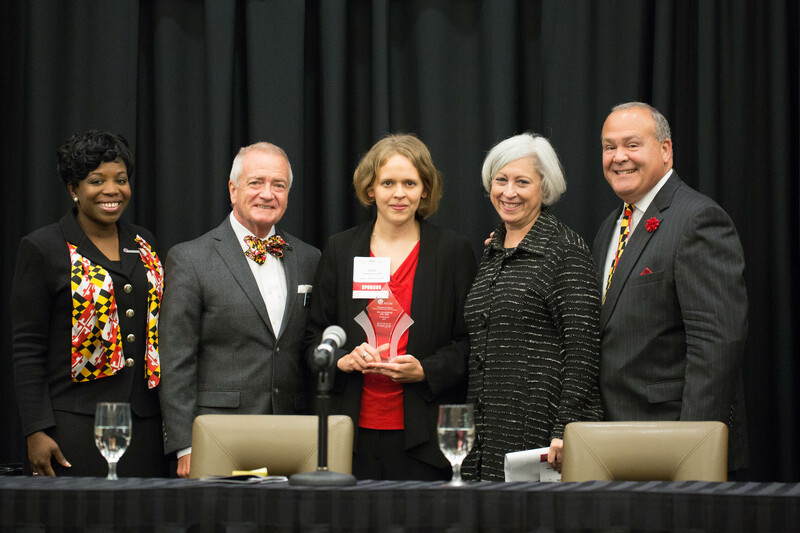 “Emerging Leader” winner Lisa Blackmore, CPA, MBA (center), is shown with, from left: AICPA Chair Kimberly Ellison-Taylor, MACPA Chair Ken Kelly, immediate past MACPA Chair Lisa Cines, and MACPA Executive Director Tom Hood. Lisa Blackmore, CPA, MBA, a partner with Squire, Lemkin + Company, LLP, in Rockville. Lisa started at Squire, Lemkin + Company in 2004 after earning her bachelor’s degree in accounting from Mount Saint Mary’s University. She completed her MBA and earned her CPA license shortly thereafter. Lisa was named partner at Squire, Lemkin + Company in January 2015 and has developed a tax practice that focuses on individual and high net-worth individuals and professional service firms. She lives on a small farm in Frederick, Md., with her husband and two young daughters. Other nominees in the Emerging Leader category were Christina Bennett, a CPA in the Annapolis / Arnold area specializing in business accounting and tax preparation; Rivka Bier, CPA, MST, a senior manager at Hertzbach and Company; Rachel Seymone Ellis, CPA, a senior associate in KPMG’s audit practice; Marian Harvin, CPA, a controller at Glass Jacobson Financial Group; Savedra Scott, CPA, president and founder of Savvy Financial Solutions, Inc.; and Brittany Sullivan, CPA, a tax senior manager at RSM US LLP. 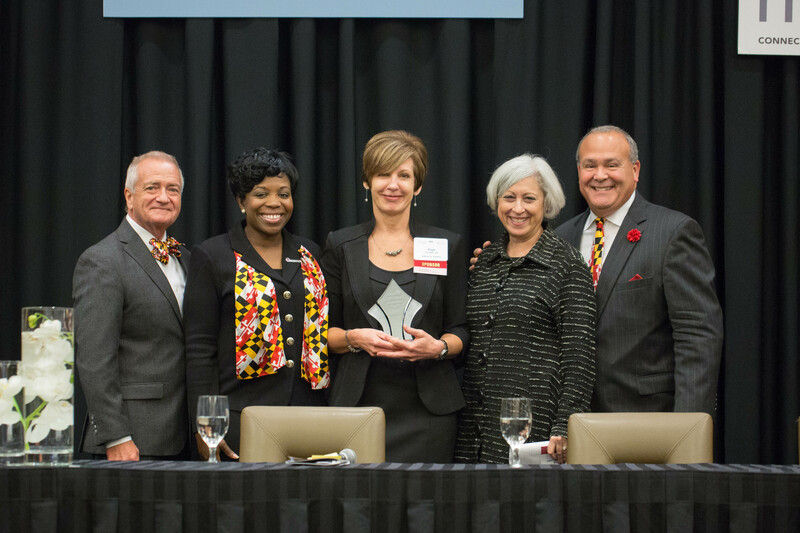 “Experienced Leader” winner Faye Miller, CPA (center), is shown with, from left: MACPA Chair Ken Kelly, AICPA Chair Kimberly Ellison-Taylor, immediate past MACPA Chair Lisa Cines, and MACPA Executive Director Tom Hood. Faye Miller, CPA, a partner with RSM US LLP. Faye has nearly 30 years of experience in public accounting, including client service and office managing partner roles. As a partner in the national office of RSM, she is a lead subject matter expert on complex financial instruments and is charged with identifying and developing talent, publishing accounting guides and whitepapers, speaking as a firm expert at conferences and on webcasts, and developing and presenting internal training. Faye served on the AICPA’s Accounting Standards Executive Committee and the AICPA’s Revenue Recognition Depository Institutions industry task force. She is a member of the United Way of Central Maryland Leader’s United and is active in community initiatives for women and children..
Other nominees in the Experienced Leader category were Nancy Buckley, CPA, a partner at Hertzbach and Company; Michelle Chopper, CPA, who provides asset manager clients with customized solutions to respond to critical business needs; Jina Etienne, CPA, CGMA, a principal consultant with EtiennePartners in Silver Spring, Md., and former president and CEO of the National Association of Black Accountants; Debby Hallett, CPA, who manages performance analysis group at Arthur Bell CPAs; Sylvia Lagerquist, CPA, president of Haines & Lagerquist CPAs; Kimberly Mustard, CPA, CGMA, a shareholder with HCF&L; and Kathy Raffa, CPA, president of Raffa, P.C.